Listener Kenneth Taylor wrote in asking if I had found a replacement for a little menu bar app I’d recommended called Mountain. Mountain is a perfect example of Tim Verpoorten’s “does one thing and does it well” menubar app. It sits in your menu bar and gives you instant access to mount or unmount physical and network volumes. Kenneth was asking about replacing it because the app hasn’t been updated since 2012 and had gotten a little bit glitchy for him. That said, Mountain still works, and it’s in the Mac App Store for $5.99. It’s a 64-bit app, so it’s potentially good through High Sierra and the OS beyond that. Not saying it’s guaranteed but at least that won’t be a limiter. But I get Kenneth’s concern. The good news is that Dave Hamilton mentioned in the Mac Geek Gab Cool Stuff Found segment a tool that might be able to replace Mountain and do a whole lot more. It’s called Parallels Toolbox and it’s made by the fine folks who make the Parallels virtual machine software. You can find Parallels Toolbox at parallels.com/…Parallels Toolbox is a menu bar app but rather than doing one thing well, it does a ton of things well. Think about it this way. Where Mountain is a socket wrench, this really is a whole toolbox full of tools. Many of the apps inside the Toolbox provide functions that can be done by other individual apps, but Parallels Toolbox piles them altogether into one clean, standardized interface. Most of the tools in the Toolbox open their own little floating window, which is an actual app. If you hit command-tab while you have one of these floating windows open, you can see the app in the app switcher. Each tool is slightly different, but for all of them you configure the tool by tapping a gear in the upper right which flips over the floating window to reveal settings. I’m going to tell you one thing that will make you not want to check out Parallels Toolbox. But I want you to promise me you’ll listen/read this through before counting it out. Ok, promise? You can’t outright buy Parallels Toolbox, you have to pay $10 per year to use it. I know, I know, I didn’t like the idea at first either. But when you think about it, $10 per year is not that much money. Let’s think about it as 83¢ per month. I want you to keep that number in your head as I describe what Parallels Toolbox can do, and see if you think it’s worth 83¢ per month. Let’s walk through the tools in Parallels Toolbox and see if we can find enough tools in here to make it worth that vast sum for you. Let’s jump right to the one thing Kenneth wanted, the ability to eject volumes right from the menu bar. Where Mountain lets you choose which volumes to unmount, Parallels Toolbox’s Eject Volumes ejects all of them at once. I happen to like that because my main use case is when I want to undock my laptop to move it somewhere else. But this sledge hammer approach might not have the finesse Kenneth or you seek. Mountain also will remount volumes with a single click, but Parallels Toolbox doesn’t have that feature. It might be my imagination but it seems way faster at unmounting my backup drive than Mountain. If you want to make a compressed version of a file or folder on the Mac, it’s as easy as right clicking and selecting compress, causing a zip file to appear next to your original content. To uncompress that archive, simply double click the zip file. If you want to encrypt as you create the archive, you’ll go through a bit more shenanigans. The Archive tool opens up with an area where you can drag in a file or folder to compress into a zip file. To be honest, right clicking is faster. The Archive tool has an option on the back in settings to apply a password if you want to encrypt. That password will be your password for everything you encrypt going forward until you change it, and the password stays on by default going forward. Pretty cool if you like to make encrypted zip files. Unarchive isn’t useful in my opinion. 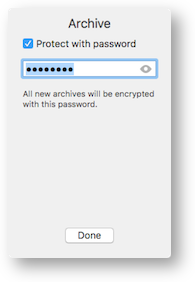 If it stored the password for encrypted archives maybe it would be, but opening a menu bar app to drag a file onto it, is a lot more work than just double clicking the zip file. Have you ever just wanted to take a picture or a video with your computer’s camera? With Parallels Toolbox that’s at your fingertips. It defaults to your built-in camera, but if you tap on the gear to flip the app over, you can change the audio source and the camera to anything you have available on your system. I was able to change it to my Cinema Display or my Logitech C920 webcam. I know QuickTime can do this but if Parallels Toolbox is right there, maybe this is easier. But the Camera tool in Parallels Toolbox has another BIG trick up its sleeve – it can entirely block your camera. In these days of hackers being able to take control of webcams, this seems like a swell tool to include. To block your camera, you need to authenticate as an administrator and restart your computer. I followed the directions even though I assumed it would only block my internal camera since that’s the only camera I could control with the Camera tool. But after a restart, I was pleased to find out that none of my apps could see any of my cameras. 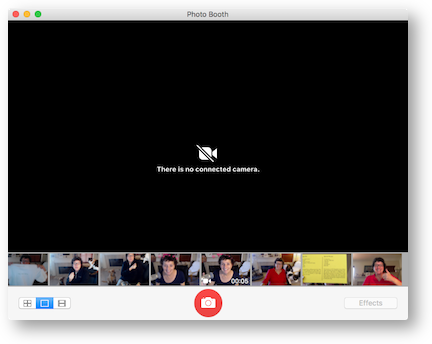 I tried Photo Booth, Skype and Webcam Settings (a menubar app I use to control the lighting and more on my C920). It was amazing to see them all just completely vaporize. I have to say I was happy I didn’t have to restart to get them all back, just a tap on the Block Camera button in Parallels Toolbox and they were all back. Pretty darn cool. Is it worth 83¢ per month to be able to disable all of your cameras when you’re not using them? I take a lot of screenshots, and I know the keystrokes by heart, but if you don’t take them all the time, it can be quite a pain. (Link to all of the keyboard shortcuts from Apple.) With Parallels Toolbox, you get a Screenshots button that gives you instant access to capture your entire screen, a single window or an area you define. No more trying to remember command-control-4! Screenshots made through Parallels Toolbox obey the rules you’ve set for the macOS built-in tool. If you haven’t modified the built-in tool, you’ll find the screenshots dropping onto your desktop as pngs with a huge drop shadow on them. While sometimes a screenshot will help you show something to a developer or maybe help a family member, other times a video is the best way to explain it. I do a lot of video screencasting using the most awesome ScreenFlow from Telestream, but maybe it’s overkill when you don’t need a high-end video editor. Parallels Toolbox to the rescue again. There’s a nifty Record Screen button with the same three options as the screenshot tool: entire screen, window or click and drag for a specific area. As soon as you select an area, you get a little video camera icon to click and then you’re recording. Sandy Foster and a few of us were chatting about WordPress over in the NosillaCast Google Plus community (podfeet.com/googleplus) and I wanted to show Sandy how easy it was do a plugin update. I was already in WordPress, so I popped open the screen recorder from Parallels Toolbox, selected just the part I wanted her to see, and recorded a 15 second video that showed exactly how easy it was. I’d like to have a keystroke to stop recording, to eliminate the bit of dead time that you get while hunting for the menu bar app and selecting to stop the video, but it was pretty easy to trim it off in QuickTime. I dragged the video into Google Photos, grabbed a link and pasted it into Google Plus for Sandy to see. Total elapsed time could not have been more than five minutes. Easy peasy as my friend Niraj always says. I should mention that the screen capture tool also captures the audio from whatever audio device you have selected in the Sound System Preference pane. ScreenFlow is $100, Parallels Toolbox is 83¢ per month. I’m just saying. I love how on my Apple Watch I can set timers, invoke a stop watch and set an alarm, but that’s not an available feature in macOS (that I know of anyway). Parallels Toolbox comes with a Time tool with an alarm, date countdown (fun for retirement and Christmas countdowns) a stopwatch, and a timer. The alarm and countdown calendars both allow you to name them, but you can’t have more than one of either of them. I’m done describing just the first row of the tools inside Parallels Toolbox. Are you convinced yet that it’s worth $10/year? On iOS it’s really terrific to have a single button available in Control center to turn on Airplane Mode, disabling Bluetooth, WiFi and cellular radios. With Parallels Toolbox you get an Airplane Mode button that works the same way. I really like that it warns you if you have Bluetooth keyboard or mouse/trackpad attached before enabling Airplane Mode. Have you ever wanted to pull video off of the internet to watch offline? With Parallels Toolbox you get a tool made for solving that problem. You get a little floating window into which you drag (or copy/paste) the url of the video you want to download, and you’re done. I presume that if the website precludes downloading, this tool won’t bypass those restrictions, but a standard YouTube or Vimeo video works just fine. You can choose what resolution you want to download using the settings on the back of the tool window. I know there are websites that will do this function for you, but if you’ve already got a tool right there in your toolbox, it’s a lot easier. Parallels Toolbox also has a Convert Video tool, and I’m not entirely sure what problem it solves. In the settings you can choose 720p or 1080p, but that’s about it. It appears to convert MOVs to MP4s, and they talk in the documentation about making videos easier to share. Doesn’t seem like one of the power features to me, but perhaps you have a need I don’t know about. Maybe you don’t need a video downloaded, but you’d like to capture just the audio from an online source. Parallels Toolbox will do that too. I tested it on a YouTube video and it worked flawlessly to download an m4a audio only version from the video. macOS has a Do Not Disturb function hidden away in the Notifications in the upper right of the Finder. You actually have to pull down after you open Notifications to get to it. Night Shift is hidden in there too. 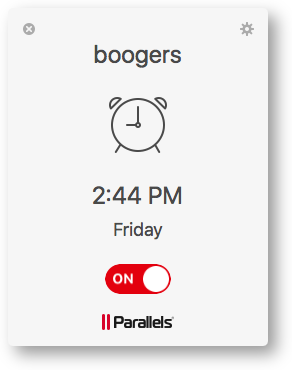 I was confused why Parallels Toolbox has a Do Not Disturb function if we already have it but in. But their Do Not Disturb doesn’t stop regular notifications, it stops the Dock from bothering you. This can be super handy if you’re giving a presentation and you don’t want some stupid icon bouncing away because it’s excited about something. I think I’ll use this when doing screencasts too. A simple feature but could be priceless. A lot of people use a menu bar app called Caffeine, that is definitely a one-trick pony. It keeps your Mac from going to sleep. With Parallels Toolbox you get a Do Not Sleep button that does the same thing. Tap once to set your Mac to stay awake until midnight (or to never go to sleep), tap again to disable. Nice to have this available with all of the other tools. If you paid attention to my Delete Me Tiny Tip, you’ve got a neat and tidy desktop. Or you’ve got those habits to dump everything on your desktop so firmly engrained that you can’t change. But now you have to give a presentation and you need a way to sweep all that crud under a rug. Enter Hide Desktop in your toolbox. One click and you’re left with only those disk volumes you’ve specified in your Finder Prefs. Another click of the Hide Desktop tool and boom, your lovely mess is all back. Do you have a particular set of apps and/or documents you need to launch all at the same time for a specific thing you do? I have that need for the live show and in fact I wrote an automator script to open everything I need every Sunday night. If I’d had Parallels Toolbox I wouldn’t have needed to write that script. Parallels Toolbox has a button called simply Launch. You drag one item onto the face of the floating window, and it flips over offering the option to add more items. Click done and it disappears. This confused me at first. But I tapped on Parallels Toolbox in the menubar and tapped an Launch and suddenly everything I’d added to it launched at once. Now how do you get these items out of Launch if tapping on it launches everything? I tried right-clicking on Launch and from there I was able to open the preferences for Launch and remove those items I’d added. I’m glad I had to do that because I made a cool discovery. Right clicking revealed an option to add Launch directly to my menu bar. You can do that with any of the tools you like! At first I thought the first row of tools didn’t allow it. Upon further tinkering I realized that the first row of icons actually are buttons that reveal more tools. 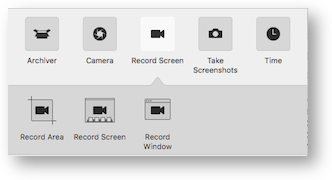 For example, Record Screen had 3 separate tools, record window, record screen and record area as we discussed before. This means you can have a button in your menu bar to sleep, to launch a bunch of apps, to turn off your cameras. This is sooooo cool! I just got my 83¢ worth right there. Like to lock your screen when you walk away from your computer? Parallels Toolbox has that. Just like Block Camera, Parallels Toolbox has a Mute Microphone button. I tried to override it in the Sound System Preferences, but I got a fly in notification from Parallels Toolbox that an app was trying to override it and was foiled! And it wasn’t just my internal mic that was muted, it was my big girl mic and the mic on the display and the mic in my C920 webcam. All were firmly muted. I even tried quitting Parallels Toolbox and still I could not unmute my mic. Very very cool. By the way, quitting Parallels Toolbox does kill some tools like timer and stopwatch. I went back and double checked the block camera tool and sure enough my cameras were still disabled when I quit Parallels Toolbox. We’ve talked about a bunch of ways to hide distractions, and if you use the Presentation Mode, you trigger all of them. Presentation mode disables sleep, hides files on the desktop, and blocks notifications and dock animations. You can even have Presentation Mode configured to autodetect external displays. By the way, Presentation Mode isn’t explained in the help file, but I figured out that right-clicking of the icon trick had an About option and that revealed exactly what it did. So if you forget anything I’ve told you, just start right clicking on items and read their about menus. Is it worth 83¢ for that one presentation to your boss to look professional? One of the banes of our existence in Apple fandom is how Apple dumbs things down sometimes. 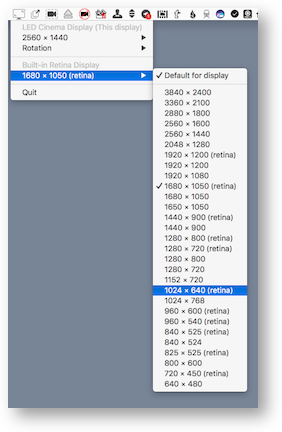 Remember how awesome it was when you could change your Mac laptop screen to a specific resolution? None of this “Larger Text” to “More Space” nonsense like we’re children who don’t understand big numbers. Parallels Toolbox has a lovely tool called Switch Resolution and it brings back the numbers. You can even rotate your screen 90, 180, or 270 degrees! I tried it and darn was it hard to figure out how to move my cursor with the screen displaying sideways! Luckily I had a second screen and it let me change them independently. Maybe that would be fun brain exercise to work that way for a while? We talked about recording video from your camera and recording video of the desktop, but what about audio only recording? Yup, Parallels Toolbox has that too. And just like with the video recorder, flip the card over and you can select any audio source you have available. 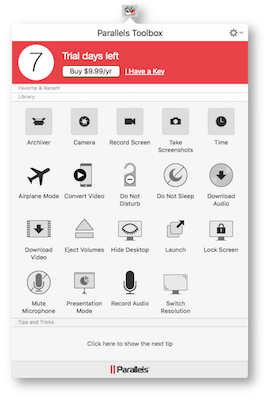 Sure QuickTime has audio recording, but if you’ve already gotten your 83¢ per month out of Parallels Toolbox, you’ll have audio recording more accessible to you. Speaking of accessibility (see what I did there? ), I tested out a few of the tools using VoiceOver. As you know I’m not an expert but I can usually tell if stuff doesn’t work at all. Parallels Toolbox is partially usable with VoiceOver but with notable exceptions. Each tool in the toolbox is represented by an icon and by words underneath it. All of the icons are unlabeled buttons, but all of the words underneath are also buttons and read out properly. So you can skip all the button button button nonsense, and just listen for the words like Camera or Launch and you’ll be ok. The floating windows have more problems though. There’s a close button in the upper left, and the settings button in the upper right, but they’re not labeled. For example, in the case of the camera app, you have to go to the third unlabeled button and hit that to take the picture. In the Alarm tool, everything works but the on/off switch, which seems like a rather necessary feature. I’m not a programmer (yet) but it feels like it wouldn’t be a big stretch to make Parallels Toolbox fully accessible, however they’ll need a bit of guidance to get it done I think. Kind of thing Scott Howell might enjoy taking on as a challenge. That’s finally it for all of the tools in Parallels Toolbox. There’s another feature though that’s handy. In that little contextual menu you get with a right click is the option to add an item to Favorites. This puts it in a drawer at the top, kind of like a toolbox actually. This area also contains your most recently used items. I like this model because you can put your favorites tools up at the top and not go digging around for them, which is especially useful for the ones that are in a submenu like the camera options. But you can put your favorite favorites up in your menu bar. Eject and Block Camera were immediately in my menu bar. Ok, now that you have heard what Parallels Toolbox can do, does it sound worth 83¢ a month? How about $10 per year? You don’t even have to decide yet, because they have a 7 day free trial. It wasn’t obvious whether this was a single machine license so I pinged @ParallelsCares on Twitter and asked them. The great news is that you can use one license on up to 5 machines! There’s also a Windows version, and if you run a virtual machine with Windows you can use the same license key since it’s on the same machine. I’m so glad that Kenneth asked about Mountain because it gave me the motivation to check out Parallels Toolbox. It’s an amazing set of tools, and I’m gladly going to give them 83¢ per month so they stay in active development. They say that you get all new tools they invent for that $10/year too! In case you’re wondering, yes, I shelled out my own $10 to register for Parallels Toolbox after writing up this review.